Today, the army announced that President Mubarak would soon step down. Egyptians filled the streets once again, sensing the long-awaited moment of liberation close at hand. Unfortunately, the rambling address which Mubarak delivered this evening was a slap in the face to the people. Rather than stick to the script the army seemed to have prepared for him, Mubarak announced that he would give some powers to his handpicked vice president (a scumbag even worse than Mubarak himself), while retaining his seat in defiance of the protesters' principal demand. The insult to the Egyptian people—and to his backers in Washington—which his speech revealed will not be forgiven. Mubarak's reign looks to be in its final hours. Tomorrow, expect protests bigger than any seen so far. Egypt's fate will be in the hands of the military: if the army deposes the president, the demonstrators will dance with joy; if it instead defends the regime, bloodshed in the streets is almost certain. 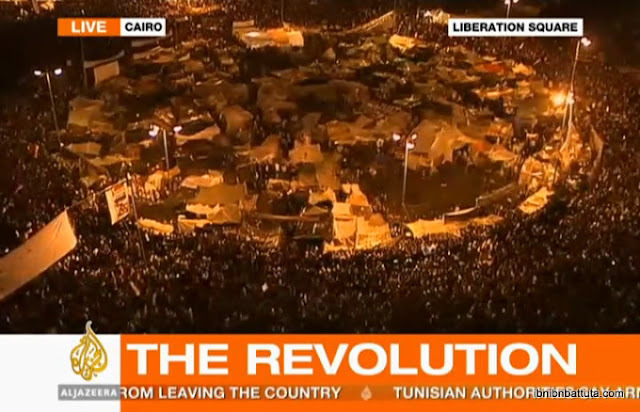 Already the protesters in Tahrir Square and across Egypt have sent a shockwave through the Arab world. But the future of Egypt itself is unclear, except for one fact: when the dictator finally falls, Egypt will have a very long and dangerous road ahead. Side note: It would be impossible to overstate the central importance which Al Jazeera has had in these events. Here in the US, its sister station, Al Jazeera English, has also filled in the gap left by the woefully shoddy American news channels, as my friend Jeb has written at Foreign Policy Watch. I encourage everyone to watch the live feed today.